Click here for diagrams of the cemetery and section A. Complete list of graves as of early 2002. "She Was the Sunshine of Our Home" d/o Mr. & Mrs. Homer Merritt. Death day also shown as 31. "Interred in Memory Hill Cemetery"
Grave has American Legion marker. Georgia PFC Army Service Corps. m. Aug. 6, 1949 to Jeanette H. Lane. "Devoted Wife and Loving Mother". On same stone as Lee Roy Lane, m. Aug. 6, 1949. Died in service. Georgia PFC 307 Inf. 77 Inf. Div. PH (Purple Heart). "Wife of Lewis H. Dent" "Mama"
on same marker as William T. Long Sr. US American Legion marker lying on top of slab - not anchored. "Father" "Peace Be Yours" On same stone as Irene D. Tuggle Stephens. "Mother" "Peace Be Yours" On same stone as Jim E. Stephens. Infant d/o Ann and Jim Brady, Jr.
w/o Walter Little Zachry, Jr.
"Wife of J. Roger Smith"
"Infant son of Troy and Robin Braxley Only one date. Birth and death assumed. "Infant Daughter of Troy & Robin Braxley" Only one date. Birth and death date assumed. "He Is At Rest In Heaven" "Dad"
"She Is At Rest In Heaven" "Mom"
"He Is At Rest In Heaven" "Husband"
"She Is At Rest In Heaven" "Wife"
"To Know Him Was To Love Him" "Little Boy"
"I'll Lend You For A Little Time Three Children of Mine", God said, "For You To Love"
"Daughter of Ralph & Carlotta Lord"
Only one date. Birth and death date assumed. "Wife of Ralph L. Lord"
Only one date. Birth and death date assumed. Child-sized grave. "God's Little Angel" Only one date. Birth and death date assumed. Child-sized grave. "Ma Ma" (on headstone). "In Loving Memory" on foot. "Daddy" On same headstone as Madie B. McFadden. "Mama" On same headstone as William M. McFadden. On same marker as Katie J. Holley. On same marker as Amory L. Holley. "Beloved wife, mother, and friend"
"Mother of Gertrude Long Linch"
Co B, 1 ALA. INF. All info per Joseph A. Moore Funeral Director, Inc. marker. All info per Moore's funeral home marker. Middle name not clear. All info per funeral home marker. First name not clear. Married Aug 18, 1944. "Gone Home" On same marker as Bertha M. Colvard. Married Aug 18, 1944 "Gone Home" On same marker as Charlie J. Colvard. Maiden name per obituary. Only one date on stone. Appears to be infant grave. "Mamie" Plaster praying hands on slab. on same marker as John M. Collins. On same marker as Mamie H. Collins. On same marker as Evie A. Segrist. On same marker as Napier A. Segrist. On same side of marker as W. Binion Wood. Other side of marker is labelled "Clark". On same side of marker as Eileen Godfrey Wood. Other side of marker is labelled "Clark". On "Clark" side of "Wood-Clark" marker. "Daddy" "Rest in Peace" On same marker as Lillian W. Bayne. "Mother" "Rest in Peace" On same marker as Ethridge Bayne. "Bill" Image of welder engraved on slab. On same marker as Maude T. Ivey. On same marker as Julian E. Ivey. "Wife of Erasmus Minor Ennis"
In Memory of. Buried Baptist Church Cemetery, Mystic, Ga.
"Wife of J. M. Gilmore"
"Wife of J. T. Cathy"
m. Jun. 11, 1948 to Jane Elizabeth King. m. Jun. 11, 1948 to Henry Chapman Cathy. No death date as of 7/5/2002. "In Loving Memory of Mindy, Twin Sister of Jane Cathy"
"Wife of Dan T. Little"
"Son of Bettie and Billy Chambers"
"Foster Daughter of Bettie and Billy Chambers"
No death date as of 7/5/2002. "Daddy" Adult-sized slab. No dates. Handwritten name on slab. Georgia Pvt 325 AMB Co 52 Div. "Wife of John Miller Smith"
"Wife of J. Robert Leard"
"Wife of Charles Hill Hurt"
"Wife of W. C. Buckner"
"Wife of W. M. Buckner"
Pvt, Co. H, 306th Infantry, U.S. Army. US American Legion plaque. On same marker as Florence T. Wooten. On same marker as Omar Holt Wooten. On same marker as Bertha Chambers. "In loving memory of Sara Mae" No last name on grave. 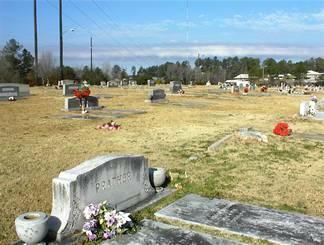 "Lost at Sea" Listed on Cemetery map as Mrs.Dixie Skipper. On same marker as Susie M. Willoughby. On same marker as Lee R. Willoughby. "Granddaddy". b. Toombs County, GA. On same marker as Edna Belle Taylor Hudson. "I'm so lonesome I could cry". Heart with broken arrow engraved on slab. "Jesus took one to be with him and left one with us"
All info per funeral home marker from Kimbrell Stern F.H. "Fran" No death date as of summer, 2002. On same marker as Carrie D. Hawkins. On same marker as Alex J. Hawkins. Capt. US Air Force. Died in Action. Buried Nettuno (Anzio) Italy U.S.
New grave as of summer, 2002 - not marked. "Loving Wife and devoted Mother"
Only one date appears on child-sized slab. Georgia CPL 80 Chemical Co.
"Granddank" "Father" m. Sep. 8, 1929 to Lorena H. Niblett. "Mema" "Mother" m. Sep. 8, 1929 to T. Austin Niblett. "Jimmy" "Daddy Pa-Pa" "Deputy Sheriff Badge #33"
A relatively recent grave as of summer 2002. Mama. "P.M." above Eastern Star emblem. "W.M." above Eastern Star emblem. w/o A.R. Mozo. "W.M." above Eastern Star emblem. w/o Royce S. Stewart. Grandaddy. Gone But Not Forgotten. No graves as of summer 2002. Death date per obituary. No death date on gravestone, but there has been an obvious burial in this grave. Florida Sgt 661 Flt Tng Sq AAF. Our loss but Heaven's gain. My Daddy. h/o Ethel Leona Polk. On same stone with Sallie Tennile. On same stone with Clarence Tennile. Husband. Gone But Not Forgotten. On headstone with Marjorie H. Moore. On headstone with Guy Moore. Ga Pvt 26 Artillery CAC. Courageous and caring, a man among men, All who knew him called him friend. "Mama's gone home with Pa."
Inf s/o G.J. (Jack) Adams, Jr. & Lavinia T. Adams. s/o Allen & Debbie Jones. "Our beloved baby budded on earth to bloom in heaven." On headstone with Viola Prosser Johnson. On headstone with James Peter Johnson. On headstone with Dora K. Hitchcock. On headstone with Edwin H. Hitchcock. In Memory of our Mother. In God We Trust for Everlasting Life. Loving Mother, Nurse and Friend. So fair, so precious, such a joy too quickly gone, our darling boy. Lord Jesus, hear our humble prayer and keep him in your loving care. Our beloved son. "Curt". "Sammy". Son, Brother. We Love You. On headstone with Martha Ann Tanner Turner. No death date as of summer 2002. On headstone with H. Ronald Turner. One who loved his family. His memory will always be in our hearts. Mason. (Engraved on stone are a two-headed eagle & sword above star.) A Good Man, Bye, I Love You. Our most precious darling born to us to live with God. PFC 371 Fightr GP AAF. "Bob". Devoted Husband & Daddy. "Vickie". Bowling pin emblem on stone. Our Love. d/o Walker & Wanda McKnight. b. Cherokee Co., Texas. Aunt of Walker McKnight. w/o Grady Butler. No dates given. Brother, Beloved Husband & Papa. Ga Pfc HQ Btry 338 Fld Arty Bn. m. Stella Burgamy per relative. Stone broken; first name obliterated. First name provided by relative. Capt U.S. Army Silver Star P.H. and OLC. Mama. w/o Ivey Lee Fuller. s/o M.G. & L.W. McBurney. d/o Lowell & Ellen Moran. b. Hardwick Ga. "Dedicated to the memory of...""...gave his life in the service for his country in Korea." Marine Corps emblem (?). Pvt 6 Co. Coast Arty. h/o Maggie Lou and Clara Bell. We hope to go to a better home not made with hands. We loved each other and put our trust in the Lord. Mother of Johnny G. Tyndall. w/o Moses A. Sherrer. He loved his Lord and was faithful to his Church. She had enough love for everyone.